Wash sago well with tap water to remove as much start as possible. Drain well. Boil water in a medium pot. Add in the drained sago. Stir often to avoid sago sticking to the bottom of the pot. Remove from heat when sago pearls turn transparent. Drain excess water using a sieve. Spoon sago pearls into moulds and leave to cool before chilling in the refrigerator for at least 1 hour. Boil water for the gula melaka. Put pandan leaves and gula melaka in water. Keep continuously until fully dissolved. Pour out and leave to cool. Keep syrup chilled. When the sago pearls have set in the mould, turn them over into a dessert bowl. Spoon 1-2 tbsp of chilled gula melaka syrup over the sago pearls, and 2-3 tbsp of coconut milk on top. 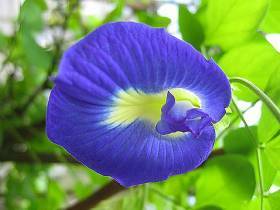 The colouring in this Nonya desert is from Bunga Telang or Blue Pea Flower. 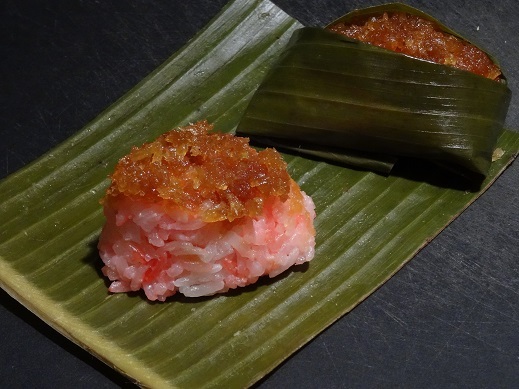 It is commonly used as a natural food dye in Nonya dishes such as Pulut Inti, Pulut Tai Tai, Kueh Salat/Kueh Seri Muka and Nasi Kerabu. However, blue is not a colour used by the Chinese. The plant flowers all year round and blooms in 6 weeks from seed. Boil ½ cup of water. Add bunga telang petals. Cook till water turns blue. Strain. Rinse and soak rice for 2 hours. Drain. Add salt and pandan leaves and mix well. Steam for 30 minutes. Add coconut milk slowly to loosened rice. Add bunga telang juice. Colouring does not have to be even. Boil ½ cup of water. Add gula melaka and sugar. Cook till sugar dissolves. Add grated coconut and a pinch of salt. Cook till mixture is nearly dry. Add glutinous rice flour mixture. Stir and cook till dry. Boil banana leaves till soft. 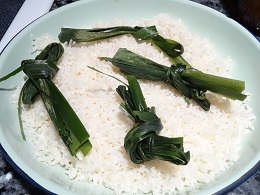 Add a portion of rice in the middle of a leaf, and top with filling. 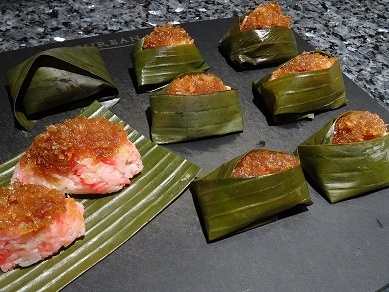 Bring both sides of banana leaf to centre and fold edges down, under the rice. Tip: Glutinous rice flour mixture is made by mixing 1½ tsp of glutinous rice flour to 2 tbsp of water. Tip: Make sure coconut mixture is dry. Drain any excess moisture to prevent rice from becoming sticky and wet.